Stabil aftermarket Porsche wheels from Victor Equipment is a new mesh design comprised of an enduring structure of 10 paired spokes radiating from a center hub. Stabil aftermarket Porsche wheels from Victor Equipment is a new mesh design comprised of an enduring structure of 10 paired spokes radiating from a center hub. The sturdy form of the spokes have been carefully sculpted to a purposeful, timeless impression in tune with Porsche tradition. 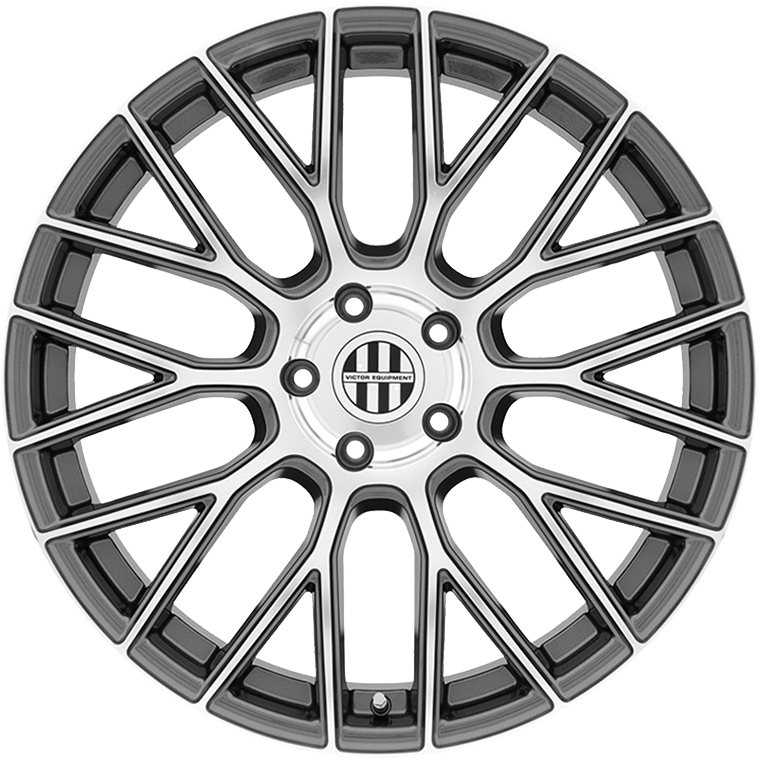 This custom wheel is available in a racy Matte Black finish as well as striking gloss gun metal with a mirror-cut face. In keeping with the Porsche ethos of ultimate performance, the Stabil wheel is manufactured using a cutting edge manufacturing process known as rotary forging. The goal is to minimize wheel weight while actually increasing its strength and durability. The face is cast then the barrel is spun at high speed under intense pressure with complex computer-controlled machinery. This fundamentally alters the molecular properties of the alloy, creating a much tighter grain structure that creates a lighter wheel than a cast wheel. Stabil aftermarket Porsche rims are available in a wide array of staggered fitments from 18 to 22 inches in diameter.The Stabil Rotary Forged® Wheel /RF™ Wheel is manufactured using a highly advanced production technique called Rotary Forging® /RF™. The rim of the wheels is forged at high pressure while the wheel is spun at high speed. This alters the molecular structure and enhances the strength of the alloy. The benefit is a much lighter weight than a regular cast wheel. Most importantly, the weight saving is in the outer rim of the wheel which dramatically reduces rotational mass and enhances vehicle performance.